My father caught some fresh trout and my mom finally showed me how she prepares her steamed fish. 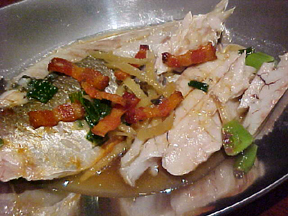 Left whole, the fish remains moist and tender. 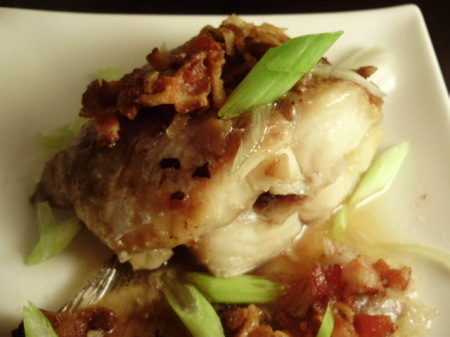 The hot bacon fat “sizzles” the fish and removes any trace of fishiness. 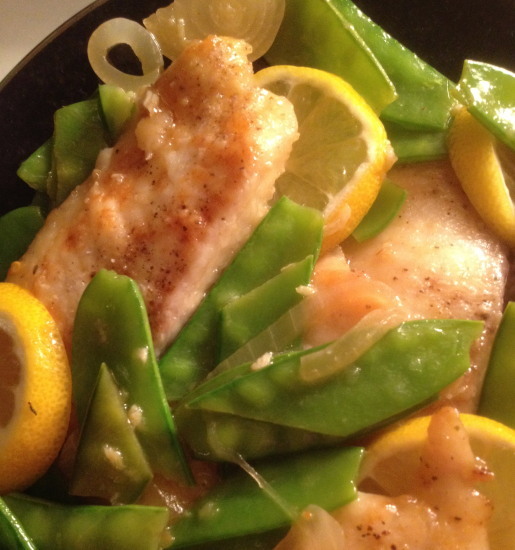 Serve this with lots of steamed rice and a fresh vegetable. 2-3 lbs. 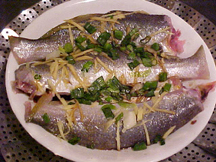 whole trout, gutted and scaled; heads may be left on for authenticity! Prepare steamer by using a metal steamer insert in a wok or other domed pot, or use a domed bamboo steamer. Rinse fish well; pat dry. Season liberally with garlic powder and salt. Place in a shallow heat-proof dish. 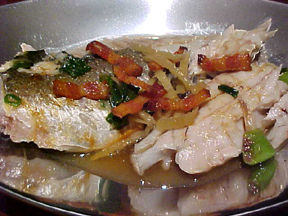 Add ginger and green onions all over and inside fish. Sprinkle with soy sauce and white pepper. Place in steamer and steam over medium heat for 20 minutes. Meanwhile, cook bacon in a small pot over medium high heat. When crisp, remove bacon. 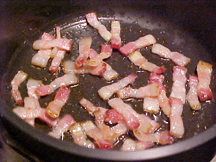 Leave bacon fat in pot over simmering heat. 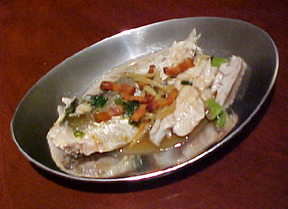 After steaming fish for 20 minutes, remove lid. 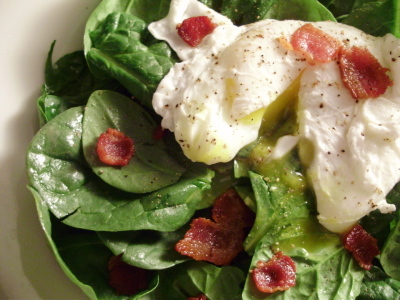 Sprinkle fish with crispy bacon. Heat bacon fat until smoking, and quickly douse fish with hot bacon fat. Serve immediately.